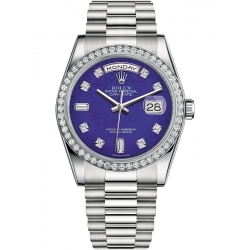 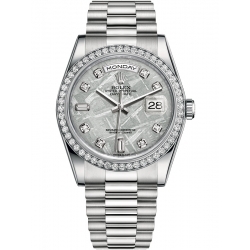 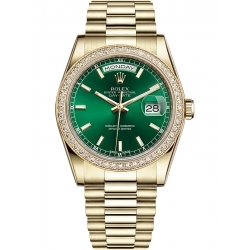 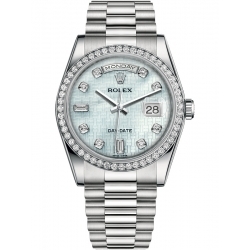 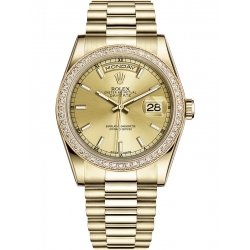 Rolex Day-Date collection offers a set of classic timepiece watches of impeccable beauty and renowned prestige, holding influence with people of status for its refinement and comfort. 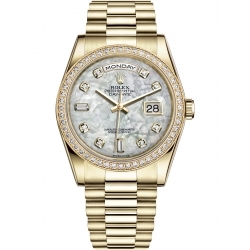 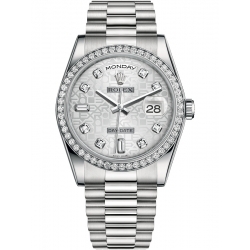 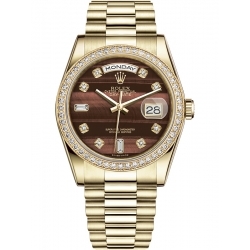 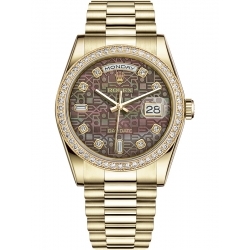 Also known as the Presidents’ Watch, the collection is painstakingly crafted from the purest of metal alloys, fusing silver, copper, and 950 platinum together to achieve the white, pink, or yellow 18 karat gold options available. 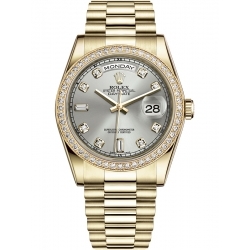 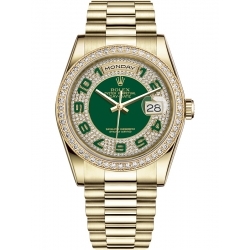 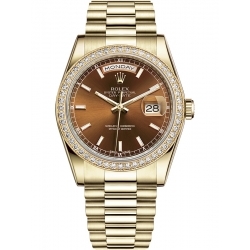 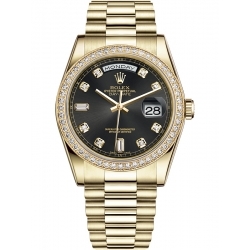 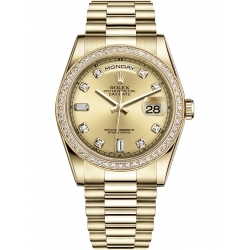 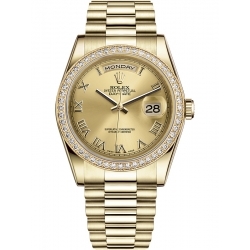 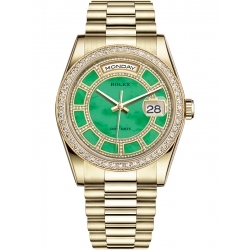 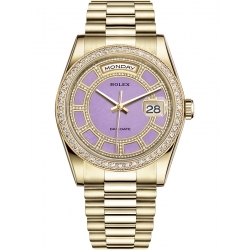 The original Rolex Day-Date watch comes in 18k yellow gold, is 40 mm in diameter, and scratch resistant sapphire crystal with a cyclops lens. 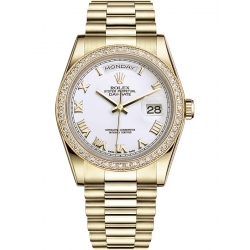 The bezel around the dial can be fluted, smooth, or gem-set with a wide array of precious stones, and the dial comes with a distinctive white face and hour markers that are fashioned in 18 karat gold to prevent tarnishing. 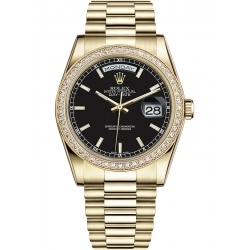 The president bracelet is designed with three semi-circular piece links, and is also made of 18k yellow gold, platinum or steel with a folding crown clasp. The day and date display that is inlaid on the watch’s face designed and manufactured in-house to ensure a perfect reading every time. 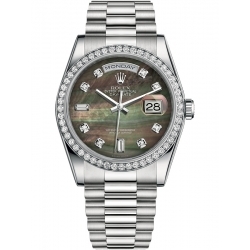 With 3255 calibre of mechanical self-winding movement, Rolex Day-Date watches have instantaneous and precise time-telling.